Reed College at that time offered perhaps the best calligraphy instruction in the country. [...] Because I had dropped out and didn’t have to take the normal classes, I decided to take a calligraphy class to learn how to do this. I learned about serif and sans serif typefaces, about varying the amount of space between different letter combinations, about what makes great typography great. It was beautiful, historical, artistically subtle in a way that science can’t capture, and I found it fascinating. The Xerox Alto displaying Steve Job's commencement speech with fancy formatting in the Bravo editor. That's an old Macintosh 512K in the background. 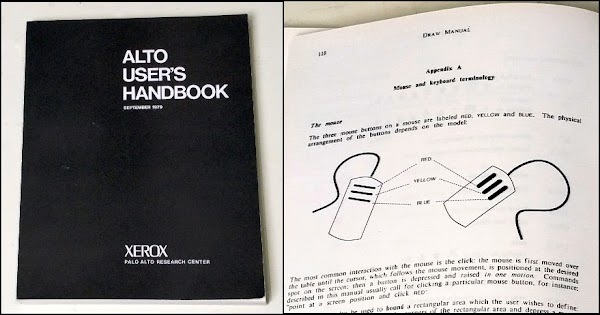 Xerox PARC used this software for its Alto documentation, producing high-quality printed manuals that mixed text and computer-generated drawings. The Alto User's Handbook (below), for example, combined nicely-formatted text with computer-generated drawings.6 Thus, by the time Steve Jobs founded Apple in 1976, Xerox had created a high-quality desktop publishing system. Steve Jobs' claim that the Mac (1984) was the first computer with beautiful typography is wrong by about a decade. The Alto User's Handbook was created using the Alto's desktop publishing software, including Bravo and Draw. The closeup on the right shows how typography was combined with drawings. Closeup of Steve Jobs' commencement speech in the Bravo editor on the Xerox Alto. This shows a few of the proportionally-spaced fonts available on the Alto. It also demonstrates centered and justified text. While Steve Job's commencement speech is inspiring, it is also an example of the "reality distortion field" at work. While he claimed that a calligraphy course at Reed inspired him to provide typography support in the Macintosh, the Xerox Alto and Jobs' visit to Xerox PARC in 1979 are surely more important. The Macintosh owes everything from the WYSIWYG editor and spline-based fonts to the bitmapped display and laser printer to the Xerox Alto. Of course, Steve Jobs deserves great credit for making desktop publishing common and affordable with the Macintosh and the LaserWriter, something Xerox failed to do with the Xerox Star, an expensive ($75,000) system that commercialized the Alto's technology. I've been restoring an Alto from YCombinator, along with Marc Verdiell, Carl Claunch and Luca Severini. My full set of Alto posts is here and Marc's extensive videos of the restoration are here. You can follow me on Twitter here for updates on the restoration. FYI - It's Charles Simonyi who created MS Word, not Simyoni. Just in case anybody tries to look him up and fails. Anonymous: oops, spell check let me down :). Fixed. I think the original Mac used bitmapped fonts only, didn’t it? There was no built-in support for spline-based fonts into Apple and Microsoft together constructed TrueType to deal with the absurd DRM-palooza of Adobe Type 1. 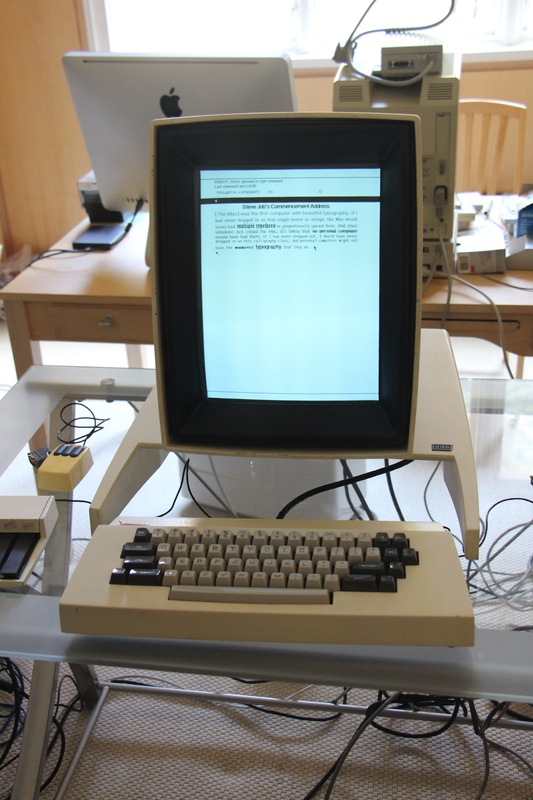 The Alto may have been the first interactive computer to have a WYSIWYG editor, but the Alto was not a personal computer. Its cost basis was way too high. When its successor, the Star, was finally commercialized it sold for $50K a seat in the late 1970s. That was not personal computer money. $5K was the top end of that market. The Xerox branded personal computer that did come out was much more conventional. I don't think they recognized that having significantly better software might let them recover its higher cost as the market expanded. A lot of outfits were surprised by the rapid adoption of the personal computers. Steve Jobs probably did base the Macintosh's use of font and typography on the Alto's, but having taken a calligraphy course let him understand what he was seeing. There's a lot of technical knowledge behind typography. Many, many people were familiar with the printed page, but only a relative handful thought about how the text was presented, especially back then. Nowadays people casually discuss serif and san-serif and joke about bad kerning, but, like bits and bytes, those were obscure technical terms back then. The font people I knew back then thought of text presentation as a combination of data and carrier, terminology taken from radio and signals theory. The carrier included the spacing, weight and orientation of the vertical strokes. (Look at Muriel Cooper's MIT Press collophon from that era.) The data was encoded in the stroke lengths, and this was supported by the horizontal components. The Macintosh text system exploited this by letting the user select a font and produce variants like italic, bold or shadowed by manipulating the carrier. This is something one would have learned from calligraphy, but not likely anywhere else. Kaleberg: thanks for your detailed comments. I'll just mention out that the Alto let you create variants of fonts (italic, bold, underline); there were simple commands in the Bravo editor to do this.